Meyer Snow and Ice Control equipment is the premier manufacturer of quality Snow Plows and Material Spreaders for the Homeowner to the Professional Meyer has the right product for the job. It’s the reason we can offer our 3/5 year warranty,* the best in the business.The rugged E-58H operating system maximizes the Drive Pro plow’s performance and ensures safe operation and functionality. The E-58H is engineered with the highest quality valves and coils and has fewer moving parts for increased reliability and reduced maintenance. To protect the operating system from the elements, the E-58H now comes standard with a custom-molded cover. ​The Meyer® Road Pro™ is the biggest and toughest snowplow in the Meyer line, the perfect match for 23,000 - 33,000 lb. GVW trucks. It leaves only the cleanest surface behind with the industry's best snow-rolling action. Available in 9-foot, 10-foot or 11-foot lengths, the aggressive 65-degree attack angle, 36-inch moldboard height with 15" radial overhang, the Road Pro throws snow higher and farther. ​Meyer Products' second generation Super-V multi-position plow, the Super-V2, offers aggressive styling and incredible plowing performance. This v plow has a 70-degree attack angle and a tapered steel blade. Available in 8.5’, 9.5’, and 10.5' lengths, the Super-V2 provides excellent snow rolling and throwing action similar to that of a highway plow. ​With our growing line of moldboards and all-season spreaders, you have more options for your landscaping and agricultural needs. Meyer’s universal mount allow you to easily attach Meyer moldboards to leading brands of compact tractors like John Deere, New Holland, Cub Cadet, Case, Massey Ferguson, Kubota, Kioti and more. ​More than 80 years ago Meyer pioneered what is now the commercial snowplow business in North America. So if you want to push snow with your light utility vehicle, go with the leading brand in the snow removal industry. Introducing the Meyer Path Pro™. Teamed with your light-duty UTV, the all-steel Path Pro is perfect for clearing snow from sidewalks or other tight areas not suitable for a plow truck. Adding a Meyer® Path Pro™ turns zero turn mowers (ZTRs) into mean snow-clearing machines. Because Path Pro plows are built by the leader in commercial snowplows, you know they are built to take on the punishment other brands can’t handle, and comes with a five-year warranty. Path Pro is available in 50″, 60″ and 72″ lengths, making it easy to find the right one to clear snow on sidewalks, alleys or anywhere a plow truck can't reach. ​With our growing line of moldboards and all-season spreaders, you have more options for your landscaping and agricultural needs. Meyer’s din plate-style mount allows you to easily attach Meyer snow plows to leading brands of skid steers like Bobcat, CAT, John Deere, Gehl, Case, New Holland and more. ​Turn your airport tractors into multi-purpose snow removal vehicles when adding a Meyer® Drive Pro™ moldboard. Compatible with TUG and Harlan ground support equipment, the Meyer Drive Pro is a compact, rugged and easy-to-use steel or polyethylene snowplow that allows you to clear tight areas such as jet ways, outdoor cargo areas or any area where a large vehicle and plow just won't fit. ​Meyer Anti-Icers are perfect for pre-treating areas that need to remain open during winter storms. When applied before the storm, the brine mixture will not allow snow or ice to bond to the pavement. Meyer Anti-Icers help you be more efficient when the snow storm arrives—since the area is pre-treated, you won’t need as much manpower or materials to clear the area of snow and ice. Our Anti-Icer is designed with a unique space-saving design. You can carry other equipment with you—like the optional Blaster tailgate mount, which lets you salt and pre-treat at the same time. ﻿​Meyer Base Line tailgate spreaders offer contractors economical ice control. The BL-240 is available in a 3.7 cu. ft. capacity, and the BL-400 is available in a 6.3 cu. ft. capacity. Both are easy-to-use and perfect for small- to medium-sized jobs like icy walkways and long, snowy driveways. ​A funny thing happens to equipment with moving parts in cold, icy, snowy weather. It slows down, breaks down, or in some way, lets you down. Take for instance stubborn chunks of fused rock salt or debris that jam the drive system of most tailgate spreaders. That’s one jam session that won’t happen with Meyer® Blaster™ spreaders because Blasters have the most powerful spreader motor available. 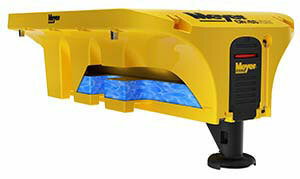 The Blaster’s unique ½ horsepower, direct-drive motor is rated at up to 70 amps of surge power and 15 ft. lbs. of stall-torque to grind through those annoying chunks of salt or sand. And the direct-drive system applies the torque directly to the auger. ​The Meyer Base Line insert hopper spreader is offered for professionals that want an all-season spreader at an economical price. The Meyer BL-600 is made of stainless steel to provide years of reliable service in snowy conditions, and its low-profile design allows the driver increased rear window visibility. ​Looking to get more use from your utility vehicle? Meet Meyer’s Utility Low-Profile V-Box, or LPV. This all-season performer can spread top dressings like fertilizer and seed, as well as salt and sand on snow and ice. It offers greater capacity and increased spreading width than hitch-mounted utility vehicle spreaders. And it fits conveniently into the back of today’s most popular utility vehicles. The Meyer LPV is powered by a sealed 12V electric motor. 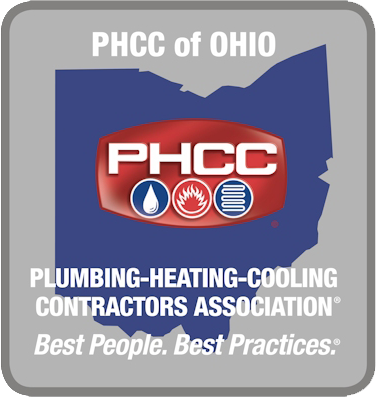 It has fewer parts than competing models, meaning it requires less maintenance and downtime. ​In snow and ice control, time is money. So go with the industry leader in pickup truck spreaders…Meyer. Meyer’s versatile line of insert hopper spreaders fit most ¾- to 1-ton pick-up trucks and share many of the same time-saving, long-lasting features of our larger MDV series spreaders. Meyer PVs are available in seven- and eight-foot lengths, and have 1.8 and 2.0 cubic yard capacities. ​The Polyhawk is designed to be your snow and ice removal spreader not only for this season, but for many to come. Featuring an unprecedented ten-year warranty on the virtually indestructible polyethylene insert hopper, Meyer dares you to compare the features of the Polyhawk to any other poly hopper spreader on the market. ​Meyer broke the mold with its new insert spreader, the Crossfire™. Not only did we design it with an integrated pre-wetting system, it’s also backed with three to five years of warranty protection…that’s the best in the industry. 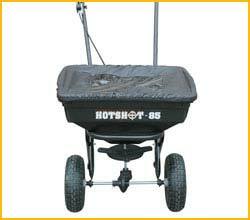 ​Get a good return on your dump truck with Meyer salt spreaders. 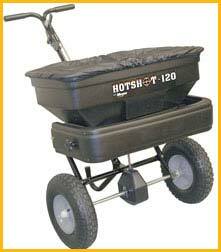 We make the very best Under Tailgate Spreaders (UTG) and Replaceable Tailgate Spreaders (RTG) available. Both use a combination of a self-contained auger with removable spinners, and can apply salt, sand or combination of both, from four to 40 feet on icy drives and snowy parking lots. ​You are ready to step up. Your customers have demanded more and you plan on delivering. With Meyer’s Medium Duty V-box Spreader (MDV), you’ll deliver the quality of snow & ice control that separates the top dogs from the part-timers. For heavy-duty and super-duty trucks (15,000 + GVW),*Meyer’s MDV is designed to give you increased material capacity and more versatility in snowy weather. Equip your medium-duty (15,000 GVW and larger) dump truck to handle your year-round spreading needs. Whether you’re shouldering material, filling a ditch, patching asphalt or spreading sand on snow and ice (which requires an optional spinner attachment), the heavy-duty Cross Conveyor is an under tailgate system that can get the job done.